The bark of Cornus florida, the flowering dogwood, was often used to treat dogs with mange and this may be the reason for its name. Florida Dogwood is often substituted for Peruvian Bark and has been used for disease of the stomach and bowels caused by weakness. A tincture of Dogwood Bark is believed to restore tone to the stomach in alcoholism, as well as treat dysentery and diarrhea. Traditionally, it has been used for treating nerve pain, insomnia, headaches or a migraine, anxiety, fear and nervous tension. It is used externally more than internally for the relief of muscle pain, as an anti-inflammatory and antispasmodic. The herbal extract of the bark has been used in herbal medicine for malaria (substitute for quinine), fever, pneumonia, colds and similar complaints. The bark of the dogwood contains tannins, compounds which are capable of forming insoluble complexes with proteins. The fruits contain vitamin C, with astringent qualities and many different minerals. The herb is often used as a substitute for quinine and was widely used for many years to treat dysentery, in cases of malaria and chronic diarrhea. It starts moving circulation of healthy blood to the worn out matter, revitalizing it and decreasing the pain from the diseased parts. It has also been found to be useful as a remedy for colic and for bringing relaxation to the sick. Dogwood bark can also be used to treat externally for hemorrhoids when applied to the affected areas, giving relief of the burning pain. The herb has also been consumed for intestinal parasites and ringworm. Dogwood bark can also be used to treat external hemorrhoids. 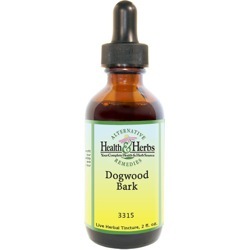 Dogwood bark is believed to help promote sleep with its sedative and analgesic effects. These properties may be helpful for the treatment of headaches, ovary, and uterus related pain, nervous debility, violent toothaches, dysmenorrhea, and neuralgia. The tincture is sometimes used in an ointment for fever, pneumonia, cold and similar complaints. Herbalists have used Dogwood bark extracts to relieve whooping cough, coughs, and bronchitis, and it acts as an antispasmodic in asthma. Dogwood has been found to be helpful in bringing down high temperatures, reduces perspiration. Oleanolic acid and ursolic acid are isomers, that are of interest to scientists because of their number biological activities. OA has been used to lower blood sugar, and listed among the herbs used for treating diabetes. These isomers may also be useful in some herb formulas as a liver-protecting and anti-inflammatory, for viral hepatitis and lower back and knee pain associated with aging. It has been used in tinctures to as a stomachic for loss of appetite, weak stomachs, pain in the pit of the stomach with a distended abdomen, (Boericke), heartburn and indigestion. The antispasmodic properties help relieve smooth muscle spasms along the digestive tract. The diuretic properties help to tone the kidneys promoting excretions of salts and water from the kidneys. Ingredients: Dogwood Bark, Structured Water, 20% Alcohol. Non-Alcohol: Dogwood Bark, Structured Water, and Vegetable Glycerin. Instructions: Use 6-12 drops in juice or water, under the tongue or as desired. May be taken 3 times daily. Shake well. Store in cool, dark place. Keep out of reach of children.